To know how to generate leads is essential if you are serious about increasing your sales. Well optimized, highly targeted landing pages are one of the most effective methods of generating authentic leads for your business. But what marketing campaigns increase traffic to your page and drive conversions? Here’s 21 awesome ideas to ramp up landing page conversions for your small business. 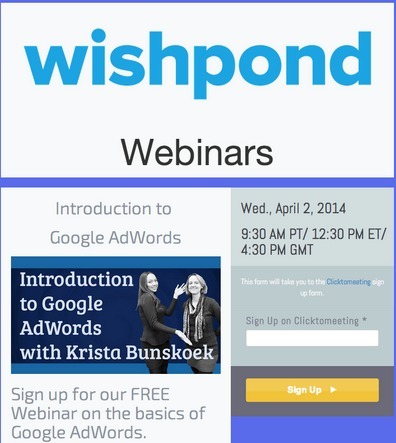 Note: All of these landing pages were created using Wishpond’s easy to use Landing Page Builder. 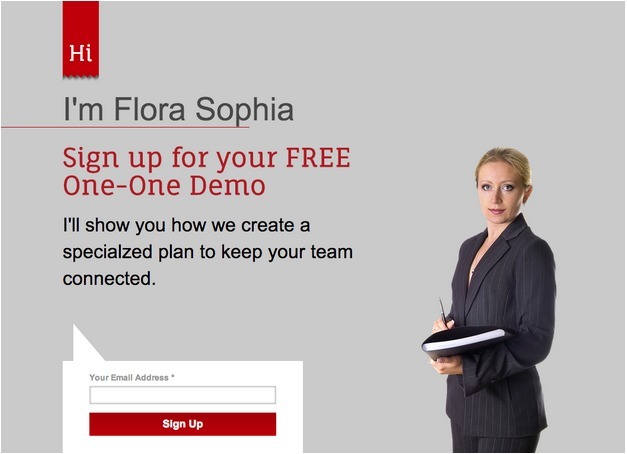 Generate leads by giving away a free, personalized demonstration of what your product offers. Get potential customers to sign up on your free demo landing page, discuss and show how your service will benefit them, and keep in touch with your buttered up leads. If a live demo is not helping you generate more leads you need, make an information sheet about your services or product. Give a teaser about the booklet benefits to your potential customers, to entice more sign ups. On your landing page, give a clear call to action, and let your prospects know that there’s no obligation to buy from you. You’ll get more leads that way, by making a less high-pressure sales pitch. Keep in touch with your new leads by offering them a regular, free newsletter update. Make it enticing by giving away exclusive deals and discounts too! Work with your marketing, sales and finance team to determine what service of product is best to give away for a free trial. Set a finite time frame for your offer. Make an email-gated landing page for the free trial (it could be your home page). Promote your trial with online ads. Get people trying out your product, and keep in touch with them through email marketing automation and ongoing direct, personal email messages. Give your customers the opportunity to get a free quote for your services. Whether you are a moving company, a tailor or even a B2B, you may have specialized, personalized services that have different pricing. Make an easy, inviting landing page, showing the benefits your service offers. Get leads to follow up with potential new customers. Once a potential customer has signed up and downloaded your free guide, follow up with an optimized email automation campaign. Do you have an online product catalogue? Make it easy to download on your site. Generate leads by giving it away for free, in exchange for an email and other basic contact information. Show that you are the business that knows about your industry. Give away free daily tips related to your market. A few simple, yet inspiring sentences related to your product and lifestyle. Create a landing page with a clear Call-to-Action, contrasting colors, and relevant visuals. Make it easy and enticing for people to sign up. You get emails for future lead conversion. Webinars are an engaging way to attract customers who are genuinely interested in your industry related topics. They also show your customers how knowledgeable you are about your products or services, and that you’re willing to share your expertise for free. Host a webinar (or a series of them) to engage with your market, build relationships, and get qualified email leads. Check out how to increase your webinar attendance with these landing page tips. When you make a live webinar, record it. Use it again, as a free resource for potential clients and customers. Make a series of them, on one particular theme to make a learning tool for your related industry. Make a landing page on your website to email-gate your awesome teachings. Does your business make a lot of good, comprehensive content for your blog? Take 5-10 related how-to articles and turn them into a valuable ebook for your customers. Then set up an email-gated landing page on your website to give your resource away for free. Free ebooks are a common marketing tactic in the B2B lead generation field. B2C’s can use them too. I’ve seen, for example, a chocolate brilliantly use email gated ebooks to give away free recipe books (using their product of course!). You attract people who are genuine prospects, and you gain trust by sharing your knowledge with them. If you’re marketing to businesses, speak the language of business. Develop whitepapers (or a series of them) with pertinent information regarding your industry. Make them relevant, current, value-adding and easy to skim. Show your company knows their stuff. Gain great prospects by email-gating your reports on your website. 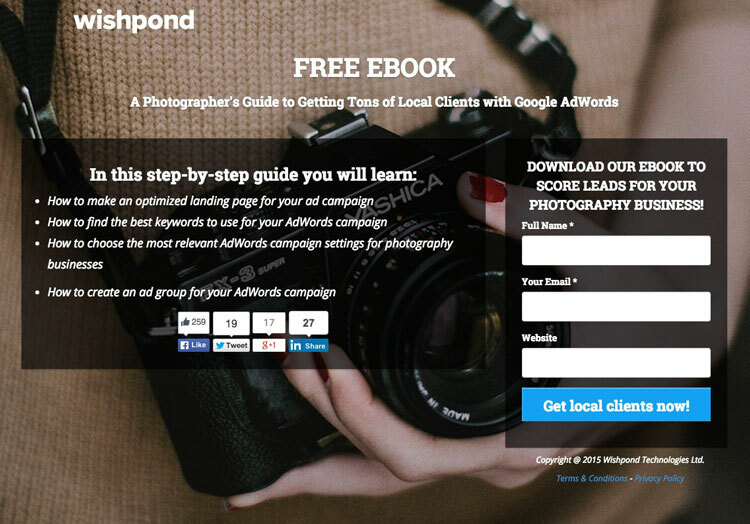 Use a landing page with a clear call-to-action and great visuals. Take your themed pre-recorded webinars, ebooks, whitepapers and other content a step further. Develop themed content including webinars, infographics, how-to videos, online quizzes and more. Setup a page on your website to host your rich resources. Email-gated it with an optimized landing page. You again create trust and show that your business is an industry leader. You get leads, and could become the go-to hub too. Setup a referral program, to get customers to spread the word about you. Give discounts to people who can bring in, say 5 new customers. Reward them with progressively deeper discounts for any additional new clients. Use an email-gated landing page attached to a great CRM. You get to keep in touch with passionate customers. In retail, there’s nothing so enticing to a buyer than a great deal. Give away coupons through your website (or Facebook Page). Attract new and returning customers to your website and generate qualified leads. By using coupons related to your business products, you’ll only get people who want what you’ve got. 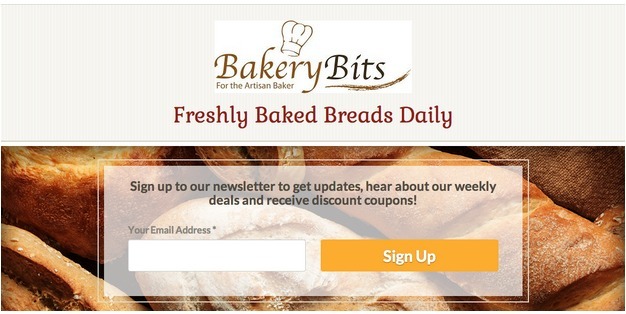 Email gate your coupon landing page, and you have your customers’ contact information. Use an email automation campaign to connect with your interested customer immediately. Stay in touch with weekly deals or other emails about your business. You can gain immediate sales, too. Who doesn’t like to win? Host a sweepstakes on your website. Make the entry email-gated, so that you collect participant leads. Be sure your prize is related to your business product or services, so you’ll get interested leads. Don’t give away an iPad if you’re in the auto repair business, for example. People will just enter for a chance to win your unrelated prize - not because they’re interested in your services. Your customers want to engage with you these days. Let them! Crowdsource a name for a new product you’ve developed. This is a brilliant marketing tactic to spread the word about your new offering. You engage your customers and give them a personal connection. They’re more likely to tell their friends about you - and buy your product when it’s available. Set up a vote contest or an essay contest on your website. Email-gate it to generate new leads, too. Take a “Name a New Product” contest a step further. Engage customer and potential customers by crowdsourcing input into a new product you’re developing or manufacturing. For example, let’s say you design or make upscale umbrellas. Give your customers input into what design you’ll manufacture next. Choose 3-10 design options, create a vote contest on your website with the design options. 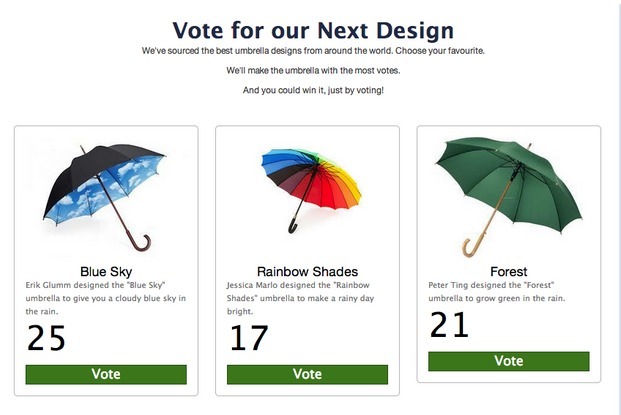 Let your customers vote on their favourite design. You get vested consumers and lots of great leads. If you’re writing a book, get your customers involved and interested in your written masterpiece - even before it’s published. Get your interested market involved by “owning” the choice of your next book cover. Start marketing your book, and gain fans with a vested interest in seeing your book succeed. Set up a lead generating landing page, and ask your prospects to choose from 2 or 3 book covers. Use the cover that gets the most votes. Use your new email leads to build relationshipsthrough email automation. Develop interested prospects into your own word-or-mouth marketing team - and sell your new book. Similar to choosing a book cover, get your prospects to choose a label for a product. Let’s say you have a winery, for example, and you’re relabeling a line of wine. Get your customers involved, by crowdsourcing it. Create a photo contest, and have people make a new label for you. Use the submissions to then get people to vote on their favourite new design. Use a landing page tool to gather new prospects who are interested in your products. Setup email marketing automation campaigns to nurture customers, and keep your brand top of mind as you prepare to launch your new product. Hopefully know you have found out something more on how to generate leads. It doesn’t have to be hard. Implement a smart marketing strategy with customer-centric landing pages. Give your consumer content, coupons and product related incentives to get authentic leads and increase sales.